Neighborhood Electric Cars, Urban Electric Vehicles, City Cars, Three Wheelers...? HELP!! 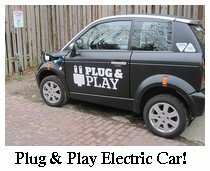 The Neighborhood Electric Vehicle, aka NEV, is a category invented by NHTSA, or the National Highway Traffic Safety Association. Speed: These don't go smokin' fast, but they're not golf carts, either. (Okay, some of them ARE golf carts. But they're street legal!) The "true" Neighborhood electric cars go 20-25 mph and no faster. The three-wheeled enclosed "city cars" go up to 45 mph. Safety: Are neighborhood electric cars really SAFE out there with the Hummers? Read my report on an "unplanned meeting" between a ZENN and a Toyota Sequoia. Charging: They plug into a standard 110v outlet (like the one where you plug in your toaster, for example), although there are 220v options (your clothes dryer) for most of them so you can recharge them quicker. Generally it takes 6-8 hours to recharge them using 110v, and half that on 220v. Operating Costs: It costs from 1 to 3 cents a mile to operate them, depending on the price of electricity per kilowatt-hour in your neck of the woods. Purchase Price: Less than your average fossil-fuel-gobbler, that's for sure! About 15k. Tax Credits: Just like the electric car itself, the once-dead federal tax credit for electric cars has come back to life! Read about the EV tax credit here. 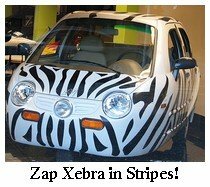 The Zap Xebra sedan painted in black and white zebra stripes is just about the cutest thing EVER. It's not a neighborhood electric car because it's only got three wheels (but don't worry, it's not going to fall over!) and it actually gets up to 40 mph. Xebras are city-class three wheelers, legally akin to MOTORCYCLES. It comes in a solar panel version called Zap Xebra Zero and a pickup truck version, too. 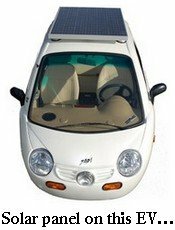 Hey, is the Xebra with a solar panel just a gimmick, or a serious solar powered car? Follow the link to read my article about it! If you want a safe, affordable, ADORABLE electric car - zebra stripes or not - from a company with a lot of promise...you'll want to look into these. This stands for Myers Motors No more Gas. This car, by the way, is commonly referred to as a Sparrow, or the Corbin Sparrow. 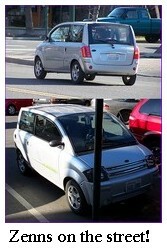 It's the same CAR; it's just that Myers Motors acquired Sparrow (the original company) or somesuch thing. This happens quite a bit, as it turns out, because times have been tough in the electric car business. 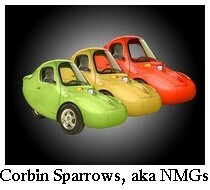 ...they're in production so they're available...ish..., they're adorable, and also three-wheeled city cars. They're fast. 75mph top speed. Comes with power windows, a cd player, and tilt steering wheel. There's room for a backpack, a rolling laptop case, or a cat carrier behind the driver...but apparently not all three. If you've got a dash of double-o-seven and need for speed, this could be your car. This actually is a four-wheeled car, unlike the two I just introduced to you. It's a luxury sedan, holds two people and some stuff, and goes not as fast as the three-wheelers do: A true neighborhood electric vehicle, but of the fairly posh variety. Zenn Motor Company gets these neighborhood electric cars originally in France, and then sends them through Canada (where it gets converted from gas to electric) to the United States. You'd think all this shipping and importing and converting might make it expensive, but it's NOT. It's on the same scale as the rest. These look very nice inside, quite luxurious. The cockpit looks just like any other (nice, new) car. 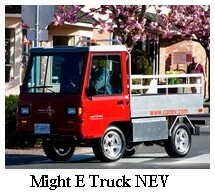 The Might-E Truck is a mid-sized electric work truck built by Canadian Electric Vehicles. 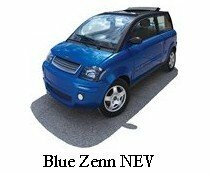 It goes 25 miles an hour, like all NEVs can, but it really expands the idea of what is possible in an NEV, as well. These are being used as mainenance and gardening vehicles, hazmat, light garbage trucks, etc. They save a ton of emissions, and a ton of maintenance costs. Golf carts as a way of life in Peachtree, GA.
Fast golf carts are so much fun! Tips for buying a used golf cart. Aptera three wheel electric cars. The Kenguru electric wheelchair neighborhood electric car. The Zenn neighborhood electric car. Go on to Neighborhood Electric Cars Page 2.